Lynne Raskin, CEO of South Riverdale Community Health Centre, speaks after accepting a Transformative Change Award for the centre’s role in achieving government approval for Supervised Injection Services. 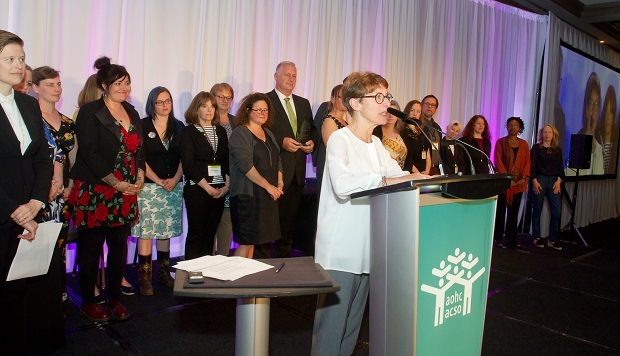 The Transformative Change Award recognizes leaders, innovators, collaborators and health champions who have been working at the forefront of transformative change helping us achieve our vision of the best possible health and wellbeing for everyone living in Ontario. On June 7, Parkdale Queen West Community Health Centre, Sandy Hill Community Health Centre, and South Riverdale Community Health Centre were recognized for their work in expanding harm reduction programs to included Supervised Injection Services. For the past five years, Parkdale Queen West CHC(link is external), Sandy Hill CHC(link is external) and South Riverdale CHC(link is external) have worked to expand their longstanding harm reduction programs by adding Supervised Injection Services (SIS). Their years of hard work included collecting and presenting evidence, building partnerships, engaging communities, developing policies, preparing submissions to both the federal and provincial governments, and working with the media. Now, all three CHCs are on the cusp of getting (or have just received) government approval and funding to set up the first SIS in Ontario. These services will undeniably save lives and help reduce risk factors that lead to infectious diseases. The fact that SIS will be located in Community Health Centres means more people who use injection drugs will have access to other much needed health and social supports. The impact of the work done by these three CHCs is already significant. Their efforts have helped shift the conversation around substance use and mental health, and enhanced the engagement in many communities towards transforming the landscape of harm reduction, drug policy and evidence-based practices. Leslieville will soon be home to a safe-injection site for IV drug users. On June 2, the department responsible for Canada’s public health approved the creation of three safe injection services programs (SIS) in Toronto: one at the South Riverdale Community Health Centre (SRCHC) on Queen Street East near Carlaw Avenue; another at the Parkdale Queen West Community Health Centre (PQWCHC) – Queen West site on Bathurst Street, just south of Queen Street West; and the third at the Works at Toronto Public Health’s building on Victoria Street, near Yonge-Dundas Square. Health Canada formally approved three applications for exemption to the Controlled Drugs and Substances Act, paving the way for the three organizations to expand their existing harm reduction programs. “This is great news in the wave of the drug overdoses we are seeing in our communities and across the country,” said Lynne Raskin, SRCHC’s executive director, in an email sent earlier this week to partners and supporters. Raskin credited those who supported the east Toronto centre’s bid to bring the expanded harm reduction service to the community. “Thanks for your supportive deputations, letters and general encouragement over the past many years to make SIS a reality for our clients, for people who use drugs everywhere and in memory of those whose lives have been needlessly lost in the needless war on drugs,” she wrote. In a joint press release, the two community health centres called the news an “important next step” in their ability to expand their harm reduction programming and one that will help to address the current overdose epidemic in Ontario. According to national statistics, an estimated 2,300 people died from an overdose in 2016. In Ontario, that amounts to at least two deaths each day. Jason Altenberg, SRCHC’s program director, said his organization’s ability to offer SIS is one more step in the journey, one small part of a response to the current overdose crisis and an acknowledgement the war on drugs must end. Angela Robertson, PQWCHC’s executive director, agreed and said the news is an important achievement for harm reduction advocates as well as a “life-saving addition” to her organization’s harm reduction services. The plan is to get the three new SIS programs off the ground by the end of the year. Aside from offering small-scale supervised injection services, clients of Toronto’s three new SIS sites will be provided with sterile injection supplies, education on overdose prevention and intervention, health counselling services and referrals to drug treatment, housing, income support and other services. In a joint release, Toronto Mayor John Tory and Ontario Health Minister Dr. Eric Hoskins said they’re pleased the federal government has approved the establishment of Toronto’s SIS sites. Tory said the announcement shows all three levels of government are partnering to keep Torontonians safe and healthy by providing people with greater access to treatment, and combating illicit and illegal drug use in Toronto. “The steadily increasing number of lives lost due to drug overdoses is a human tragedy and cannot be acceptable to anyone in a caring city such as ours,” he said in a June 2 release. Late last week, the Ontario government announced it would be invest $3.5 million to install and operate three supervised injection sites in Toronto. Last July, Toronto city council unanimously supported the SIS sites, which are the first in Canada since Vancouver’s Insite was established in 2003. A prescription heroin user receives his sterile, pre-measured dose of heroin for using in the injection room at Crosstown Clinic in Vancouver. Health Canada approved three supervised drug consumption sites on Friday in Toronto — marking the first time the county’s most populous city will be allowed to provide the harm reduction service. These approvals come one week after the department approved four other sites: three in British Columbia and one in Montreal for a mobile site. Before last week, the only federally sanctioned supervised consumption sites in North America were located in Vancouver, due to the fact that a cumbersome and restrictive application process made it nearly impossible for communities to get the necessary approvals. But a new piece of federal legislation implemented in May, Bill C-37, has eased those restrictions, making the process a whole lot easier amid an opioid overdose crisis that has claimed thousands of lives in recent years. Health Minister Jane Philpott has estimated that 2016 saw around 2,300 overdose deaths in Canada. Philpott has been pursuing a suite of progressive drug policies to help address the ongoing crisis that has swiftly moved from BC to the Maritimes. Though Philpott has rejected decriminalizing illicit drugs, citing a lack of evidence, she has made the opioid overdose antidote naloxone more readily available, and introduced measures to allow communities to import prescription heroin in bulk as a treatment for those with chronic opioid addictions. For Jason Altenberg, director of services at the South Riverdale Community Health Centre, which will open one of the three sites, this represents a huge milestone for the city that’s seen rising overdose rates over the last decade. He said he hopes the proliferation of the sites across the country will prompt serious discussions about the decriminalization, and ultimately regulation, of illicit drugs in the future. Toronto City Councillor Joe Cressy, who has been at the forefront of the city’s effort to get the sites approved, previously told CBC drug users who use the service will be supervised by nurses, and access to other treatments will be available if they choose. “That’s part of an integrated healthcare approach to drug use that is desperately needed in this country and city,” he said. There are now 12 federally approved safe consumption sites in Canada, and at least a dozen other applications for sites from other cities are currently in the queue.